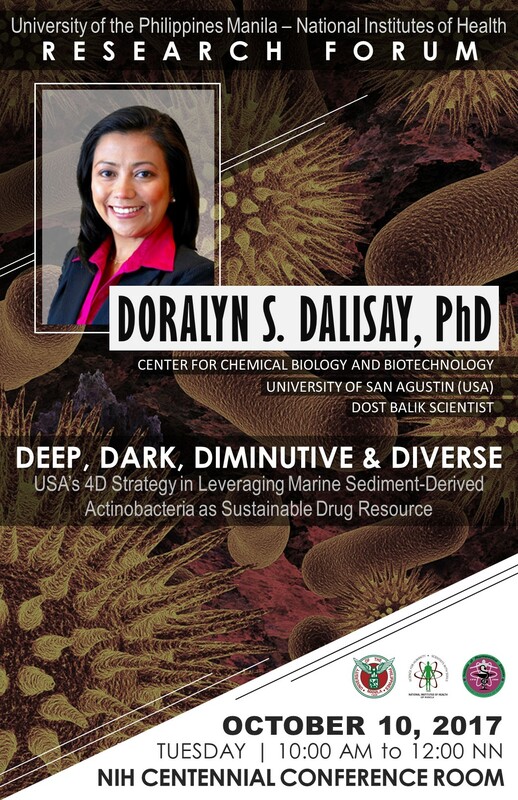 You are invited to attend the NIH Research Forum entitled, "Deep, Dark, Diminutive and Diverse: The USA’s 4D Strategy in Leveraging Marine Sediment-Derived Actinobacteria as Sustainable Drug Resource" on 10 October 2017, Tuesday, 10:00 A.M. to 12:00 N.N. at the NIH Centennial Conference Room. Registration is free with snacks and certificate of participation. Kindly confirm the names of attendees to Ms. Sheila Bolante at 5672054 or shbolante@up.edu.ph.